Rat is known to be one of the most intellectual animals of the 12 Chinese zodiacs. Natives with this animal sign are charismatic and curious. They are stubborn by nature. Whether it is a professional or personal relationship, Rats favor their own interests. On one hand, they are charming and sociable while, on the other hand, they are cool. They are creative and smart and quite good at understanding situations. Rat natives are attentive by nature. They are known to be passionate in love. Dedicated to their family and friends, their close ones like them due to their earnest comfort and advice. If you are a Rat, you take advantage of the opportunity by taking steps forward to achieve the goal. However, you cannot refrain from moving quickly as you are impatient. You can cross your limits, which may not be good for you. The best trait of Rat natives is that they can easily survive. They are always able to figure out a way to get out of the trouble. You cannot be a friend with a Rat native for a long time, as they are perfectionists. Being telepathic, they have great insights. But, they become loners at the end of the day as they are unable to trust others. They can create magic with love but, they can grow suspicious and paranoid soon. In the Chinese New Year 2019, Rat natives are expected to witness a period of change and transition. Remember your year is getting closer, as 2020 is the “Year of the Metal Rat”. This Year of the Earth Pig lends you a chance to reflect on your past 12 years. It is time that you get rid of all the junk that has cluttered your life. Only then can there be novelty in your life. As you regain self-esteem and become more pragmatic this year, you are able to organize your leisure time. If you are a Rat native, who is anxious to restructure his life, you may have to wait until this year-end. 2019 may not prove to be so favorable for undertaking key projects. Year of the Earth Pig 2019 marks the end of a complete rotation cycle of the twelve signs of the Chinese Zodiac. Rat natives, therefore, will realize the need to change their course. It is high time that you get ready to fight alone. You can turn your aspirations into reality. According to the Chinese Horoscope, 2019 may be a crucial period for you. You may need some more time to get rid of pessimism or negative thoughts. You may now figure out your priorities and then function according to prioritization in 2020. You are expected to be ambitious during this year. Your primary motive is to compensate for all the lost time at any cost. Rat natives wish to put all their energy and enthusiasm in accomplishing the best in their lives. Your desire to explore better prospects and reach new heights may fulfill in 2019. In short, there may be fulfillment of your desires of renovation. In the Year of the Pig 2019, all single Rats may have passionate bonding opportunities. At this time, you may have romantic meetings at parties and social events. There are higher chances of you strengthening your friendship at this time. Such reinforcement may help you find your soul mate within the friend-circle. Rat natives are sentimental by nature, but you need not be overconfident at this time. Your overconfidence may result in moments of misunderstanding and fights on trivial issues. Finally, you will be careful enough to make promises. You are not someone who makes promises he or she cannot keep. According to Chinese Zodiac Compatibility, natives with Rat and Pig animal signs are highly compatible. They can easily find a family with one another. Both of them are Water signs and this may be the cause of their attraction. If you are a Rat native, you may not find friendship or love with Pig natives but, you two can decide to spend life together. The Rat and the Pig share the same joy of life, a voracious curiosity, and an unwavering positivity and hope. If you are a man or a woman born during the Year of the Rat, you may have fair chances of entering into a relationship with a Pig. What you need the most is building the relationship on a solid foundation. During this Year of the Earth Pig, Rats may even decide to get married and this decision will be in their favor. You may, however, choose the date of wedding carefully. Marry only during the months that are the most favorable for you. According to Chinese Astrology, Rat natives are known to be the most compatible with Monkeys and Dragons. You may develop an excellent relationship with those having Monkey and Dragon as their animal signs. Your alliance with them may prove to be favorable for both business and marriage. Together, you will enjoy happiness, prosperity, and success. You are not at all compatible with Horses. There may arise hostility and bitterness between the two of you. Rats and Horses don’t have much in common. Chances are you won’t have a long-lasting relationship with a Horse native. 2019 promises good luck and charm to Rat parents. The parent-child compatibility of a father or mother born in the Year of the Rat with the child born during the Year of the Pig is good. As far as your social life in 2019 is concerned, you may be influenced by those whose interests differ from you. They may want you to live a life that does not suit you. To put it simply, Rat natives may find their social life challenging at this time. Rats may be advised to maintain a distance from friends who encourage them for self-destruction. Chinese New Year 2019 brings opportunities for you to remove all negative thoughts and anxieties that have kept you off track. You may also decide to get rid of those who refuse to believe in you. In terms of job and career, this year may be favorable for Rat natives. They may expect to travel a lot due to personal and professional trips. It is the best time to learn and enhance knowledge. In the Year of the Pig, adapting to a new job will be easier as compared to your job adaptability skills last year. You can evolve in your career in a positive manner, when you master a new computer tool or learn a new language. It may not be wise to change your profession or job position during this year. You may have to wait for it till the next year. When it comes to money or finance, Chinese Horoscope for 2019 foretells interesting investment opportunities. This year may prove to be advantageous for those who excel in the field of financial analysis. Rats are known to be smart and analytical. 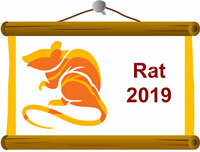 If Rat is your Chinese Zodiac sign, you may need to be careful before rushing on any interesting opportunities. You may not refrain from postponing new financial tasks, when in doubt. You may suffer a minor money loss due to miscalculation. Rats may, therefore, need to conduct business wisely and with patience. You may not wish to waste money unnecessarily. This is the time when you should exchange good practices with like-minded individuals in your career. 2020 will be your year and it may prove extraordinarily good for you. As 2019 comes to an end, Rat natives may avoid any kind of speculations, especially when it comes to real estate and gambling. You may, instead, use this year-end time to save money. Control your desire to spend a lot. This year, you may be able to deal with crisis in a better manner. You have the power of observation and are known for self-preservation. You are capable of figuring out live-saving solutions or escape critical situations. If you are born in the month of Rat, according to Chinese Astrology, you may enjoy excellent health in 2019. You may be physically quite active at this time. Exercising helps you to keep in shape and also become immune. You may be able to fight with diseases better than before. In the beginning of the Chinese New Year 2019, Rat natives may suffer from health problems due to negligence. You may feel weak at times. This is when you should understand the need to change your attitude, diet, and overall lifestyle. Being a Rat, you should know that stomach is the most sensitive organ in your case. Blood vessels are also an important part of human body. Arterial hypertension and ulcerative gastric infections may affect you at this time. Besides, you need to take care of your mental health this year. You may feel more stressed this year than before. You may be tensed, full of nervous tension, and aggressive. For those born under the Rat zodiac sign, exercising to relieve the nervous system, are beneficial. During the second half of 2019, you may suffer from small health problems. Rats need to take care of themselves and avoid excess of anything during the first six months this year. Month of the Horse, that begins from June 3, 2019 and ends on July 2, 2019, may be critical for your health. Rat natives should remember that Month of the Horse, that begins from June 3, 2019 and ends on July 2, 2019, is the least favorable period for them. Most favorable periods for Rats in 2019 are Month of the Dragon in April, Month of the Rat in December, Month of the Ox in January, and Month of the Monkey in August. All in all, 2019 will bring mixed benefits for Rat natives. There will be ups and downs in career, love, money, health, luck, and overall well-being. January 2019 will be lucky and auspicious for you. You may plan something important during this month. In February, you may require to be careful of your health and other related issues. March may prove to be a fantastic month. It may be the best time to begin something new. During April, you may need to step back and not let your success affect you. This is the time when you need to be “down-to-earth”. You may have a hectic schedule the next month. You may be super busy in your job or business. But, you must pay proper attention to your health at this time. In June this year, you may begin to learn new skills. Your focus may be on skill building and improving your talent. You may even develop new hobbies at this time. July is the period when paying extra attention to relationships may become important. You may need to devote more time to your family and friends. August may be the right time to change your lifestyle. September may prove to be favorable for career-related decisions. You may not want to be in haste at this time. Next month, Rats should watch their diet and lifestyle. Lifestyle management should be the ultimate objective at this time. November may be an excellent month for Rat natives, as they may get whatever they want at this time. Everything you touch turns into gold. During this month, you may do well in your career and personal life. You may even plan to invest and make money. Starting a new business may not be a bad idea. It may prove to be highly profitable for you. December assures fun, holidays, and enjoyable time you may want to spend with your loved ones. You may plan to take time off work.